On June 27th, we will be hosting an informative breakfast briefing focused around Nutanix, recently named the market leader in Gartner’s Magic Quadrant for Hyperconverged Infrastructure. Gartner predicts that HCI will make up 24% of the Integrated Systems market by 2019 and IDC expects that by 2020, 40% of enterprises will have deployed hyperconverged within their IT estate. It is now more important than ever for businesses to look at this technology and how it can reduce operational costs and improve agility. Learn about why hyperconverged infrastructure has emerged as one of the most popular architectures on which organisations can build private enterprise clouds. 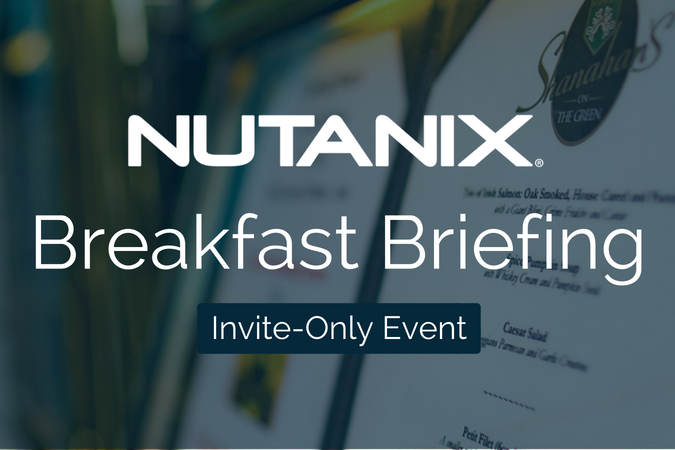 Breakfast will take place on Wednesday, June 27th in the prestigious Shanahan’s On The Green and will be led by top experts from Nutanix who will explain how they are revolutionising the data centre to reduce costs, improve agility and increase scalability. We will also be joined by John Stone, CTO of Continent8 for a customer interview. This breakfast briefing is by invite-only and registration is required before the 20th June.